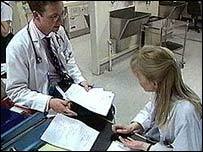 A shake up of training for junior doctors has been unveiled by the government. In future, trainee doctors will have to demonstrate competence in areas such as communication and consultation skills, patient safety and team working. The two-year training programme will include placements across a range of specialties and in primary, as well as secondary care. The aim is to give junior doctors as wide an experience as possible. An educational supervisor will oversee each trainee, and all will benefit from a dedicated clinical supervisor. The new structure will replace the current final year of basic medical education - the Pre-Registration House Officer year - and the first year following qualification, as a Senior House Officer. Sir Liam Donaldson, Chief Medical Officer for England, said the new Foundation Programme curriculum marked a new era in UK medicine. "For the first time, doctors will have the opportunity to explore a range of career options, while ensuring that their acute clinical and professional skills are secure and robust. "This is very much a 'curriculum for patient safety', ensuring that, at the end of their two years of training, doctors are both confident and competent and we are delighted that the UK is leading the world in innovations in medical education." Health Minister John Hutton said junior doctors would get a much broader range of "tasters" in areas of medicine they would not previously have experienced. "We are moving to a situation where 80% of patient care will be provided in primary care environments so we want more trainees to spend time in places like GP surgeries and Walk-in Centres as the shift towards treatment in primary care settings rather than hospitals becomes the norm." Professor Sir Alan Craft, chairman of the Academy of Medical Royal Colleges, said: "The curriculum is an important piece of work. It heralds a new era in medical training and education in the UK. "As healthcare changes, the Foundation Programme curriculum will ensure that doctors going through the system are fit for the modern healthcare service." A British Medical Association spokesman welcomed the fact that the new training requirements had been made very clear. However, he said: "The new methods of assessment will require more time to be set aside both for junior doctors and the people training them. "It is essential that the new system is properly funded."